Background Varicella universal vaccination (UV) has been implemented in many countries for several years. Nevertheless, varicella UV remains debated in Europe and few data are available on the real burden of infection. We assessed the burden of varicella in Belgium through analysis of hospitalised cases during a 1-year period. Methods Data on children admitted to hospital with varicella were collected through a national network from November 2011 to October 2012. Inclusion criteria were either acute varicella or related complications up to 3 weeks after the rash. Results Participation of 101 hospitals was obtained, covering 97.7% of the total paediatric beds in Belgium. 552 children were included with a median age of 2.1 years. Incidence of paediatric varicella hospitalisations reached 29.5/105 person-years, with the highest impact among those 0–4 years old (global incidence and odds of hospitalisation: 79/105 person-years and 1.6/100 varicella cases, respectively). Only 14% (79/552) of the cohort had an underlying chronic condition. 65% (357/552) of children had ≥1 complication justifying their admission, 49% were bacterial superinfections and 10% neurological disorders. Only a quarter of children (141/552) received acyclovir. Incidence of complicated hospitalised cases was 19/105 person-years. Paediatric intensive care unit admission and surgery were required in 4% and 3% of hospitalised cases, respectively. Mortality among Belgian paediatric population was 0.5/106 and fatality ratio 0.2% among our cohort. Conclusions Varicella demonstrated a substantial burden of disease in Belgian children, especially among the youngest. Our thorough nationwide study, run in a country without varicella UV, offers data to support varicella UV in Belgium. Varicella is usually a self-limiting disease but complications are commonly described. Universal vaccination (UV) against varicella has shown good results in some countries but is not largely implemented in Europe. Reliable data on the incidence and clinical epidemiology of varicella among hospitalised children are lacking in many countries, notably Belgium. This study shows a high burden of varicella disease among otherwise healthy Belgian children, as reflected by a significant incidence of paediatric varicella hospitalisation and substantial rates of complications. The highest impact was observed among the 0–4 years old children. Our thorough nationwide study provides recent data to support UV against varicella in Belgium. Varicella (chickenpox), caused by the varicella-zoster virus (VZV), usually presents as a vesicular eruption associated with general symptoms like fever and malaise. Endemic worldwide, this infection is self-limiting in the vast majority of infected individuals.1 ,2 However, some complications are commonly described, mainly skin or disseminated bacterial superinfections, central nervous system disturbances, pneumonia and haematological disorders.1 ,2 Although these complications are more frequent and severe in high-risk subgroups (adults and adolescents, pregnant women, immunocompromised patients), they can also affect otherwise healthy children and subsequently increase the burden of the disease, in addition to its high societal and economic impact. In Belgium, varicella incidence is estimated around 113 000 cases/year, leading to 28.8–35.7 general practitioners (GPs) visits/104 people per year.19 However, routine varicella vaccination is not yet recommended in our country. The vaccination coverage based on a subnational survey was estimated to be less than 2.5% (2-dose schedule).20 Few data are available on the real burden of varicella disease and on the potential benefits achievable from a national vaccination campaign in Belgium. In this study, we prospectively assessed the burden of varicella disease over the whole Belgian area through analysis of hospitalised cases during a 1-year period. This national survey was done in collaboration with the Scientific Institute of Public Health (SIPH). The study used a prospective design collecting all paediatric varicella-related hospitalised cases over a 1-year period (1 November 2011 to 31 October 2012) in Belgium. All paediatric wards were identified by cross between ministerial and national paediatric societies’ registers. All teams were invited to participate by personal mailing and phone contacts, as well as through the recording system of the SIPH. Inclusion of eligible cases was first prospectively carried out by local teams concomitantly to their routine practice and then retrospectively completed by a data-nurse reviewing admission files and computerised file summaries. Clinical and epidemiological data were recorded from medical files through a predefined electronic questionnaire. Data from non-participating centres were recorded on log sheets to estimate the incidence of disease as precisely as possible. Strict definitions were used for varicella, varicella hospitalised case, complicated case and rash intensity that are provided in online supplementary appendix 1. All children aged 0–15 years old meeting the above case definition were eligible, regardless of their comorbidity or previous medical history. Children with varicella but hospitalised for another reason or admitted for <24 h were excluded. Nosocomial varicella infections were also excluded. The study protocol was approved by the ethics review committee of the coordinating centre (HUDERF) and submitted to the ethics committee of the other participating hospitals. To ensure confidentiality, patients were identified using their initials, date of birth and zip code only. Epidemiological results are presented as rate of incidence of varicella disease (total and complicated hospitalised cases) by Belgian total and paediatric populations (population estimated for those aged <16 years in 2011–2012). Differences between groups were assessed by Fisher's exact test or χ2 test for non-continuous variables and Mann–Whitney U test for continuous variables. A two-tailed p value of <0.05 was considered as statistically significant. We collected data from 101 hospitals, covering 97.7% of the total paediatric beds available in Belgium. Five hundred and fifty-two children hospitalised for varicella were recorded during the study period. Based on the national demographic data available on 1 January 2012,19 the incidence of varicella-related paediatric hospitalisations and of complicated hospitalised cases was 29.5/105 and 19/105 person-years, respectively (table 1). Hospitalisation policy seemed homogenous all over the country, since the distribution of collected cases followed exactly the percentage of population allocated to each of the three regions. The distribution of hospitalisation during the study year showed the usual seasonal varicella peak occurring around end of spring (May and June; data not shown). The burden of disease was highest among preschool children who represented the major part of the entire study cohort, as well as of the complications (table 1). The proportion of complicated cases among hospitalised patients was quite similar between both 1–4 years and 5–14 years age groups (78% and 75%, respectively), but lower among children <1 year (51%). The incidence of varicella-related ambulatory visits was assessed at almost the same period through a sentinel network of GPs.19 Among the population 0–4 years old, they reported an average of GPs varicella outpatient visits of 495/104 people-year. Taken together with our findings, we could estimate the rate of hospitalisation per varicella case to be around 1.6% in that preschool population (0–4 years old). Similar extrapolation led to a rate of hospitalisation for complications among all varicella cases of 1.0% in that age group. Baseline characteristics of our cohort study are summarised in table 2. The vast majority of patients were younger than the age of 4 years old; 14% (79/552) had at least one underlying chronic condition. Only four had received one dose of varicella vaccine that was administered within the month before hospitalisation except for one child vaccinated 6 months before admission. Fourteen per cent (79/552) of children presented with severe vesicular rash on admission, whereas 17% (N=93) were reported to have only a mild eruption as defined above. The median time between the first lesions and hospitalisation was 3 days (range: 0–25 days). The main reasons for hospitalisation were suspected bacterial infection (49%), poor general status (20%), dehydration/anorexia (11%), the presence of neurological complications (10%), concomitant pneumonia (9%), high-grade persisting fever (6%), stomatitis (5%), underlying condition (5%), age below 3 months (3%) and social issues (3%). Poor general status, high fever and feeding difficulties justified admission in 34% of the youngest children (<2 years). The median duration of hospital stay was short (3 days, IQR 2–5) but was up to 40 days in the most severe cases. Sixty-five per cent (357/552) of children had one or more complications detailed in figure 1. Globally, the presence of any bacterial superinfection (not including pneumonia) represented two-thirds of complicated cases (235 children, 43% of the entire cohort). Bacterial skin and soft tissue infections were by far the most common (59% of complicated cases, 204 children). Among episodes with an available microbiology, meticillin-susceptible Staphylococcus aureus and group A β-haemolytic Streptococcus were the main causal pathogens. Only three children had meticillin-resistant S. aureus infections. Neurological complications (N=56, 10%) consisted in febrile seizures (29/56), cerebellitis with ataxia (13/56), encephalitis (6/56) and meningitis (2/56). Forty-nine children (9% of the cohort) suffered from pneumonia; out of them, 21 (43%) were recorded as having viral pneumonia, whereas in the remaining 28 (57%), a bacterial aetiology was suspected and treated accordingly. Rare complications included haemorrhagic vesicular rash (two cases), staphylococcal scalded skin syndrome (one case) and disseminated vasculitic purpura (one case). Of interest, four babies had a neonatal varicella, all of which were self-limiting. No Reye's syndrome was reported. Distribution of varicella-related complications. N=357 patients; 4S=staphylococcal scalded skin syndrome. Only 26% (141/544, 7 missing data) of children received acyclovir for a median duration of 5 days (IQR 3–5 days; maximum 21 days). Out of them, 72% (101/141) received a complete intravenous course. Valacyclovir was not prescribed. In contrast, 58% (322/552) of the children received antibiotic therapy that was administered intravenously for half of them. Drugs most prescribed were amoxicillin–clavulanate (31%), penicillin or oxacillin (22%) and clindamycin (7%). The median duration of therapy was 7 days (IQR 5–10 days, range 1–42 days). Invasive surgery was part of patient's management in 15 cases (3%). Interventions consisted in abscess or pleural drainage, joint aspiration and wound debridement. Paediatric intensive care unit (PICU) admission was required for 20 children (4%), with a median stay duration of 5 days (range: 2–14 days). The main reasons for admission to PICU were encephalitis/seizures (N=5), sepsis with haemodynamic instability (N=4), poor general status with severe pain/dehydration (N=4), need for intensive observation due to underlying condition (N=3), severe combined immunodeficiency (N=1) and the presence of intestinal ileus (N=1). Four children (20% of those admitted to PICU) needed mechanical ventilation and one (5%) non-invasive ventilation support. One 17-month-old girl died from severe bacterial sepsis 6 days after her varicella rash started. The diagnosis of toxic shock syndrome due to group A β-haemolytic Streptococcus was suspected on clinical presentation though no microbiological confirmation could be obtained. The fatality rate among hospitalised cases and complicated hospitalised cases was 0.2% and 0.3%, respectively. According to analysis of death certificate records, the varicella-related mortality rate inside the Belgian paediatric population that was around 0.5/106 in our study was stable during the last decade21 and in line with other European reports (tables 1 and 3). While the infection completely resolved in 99% (547/552) of children, four of them (1%) had sequelae at discharge consisting of reactive arthritis, ataxia, complex epilepsy or thrombophlebitis. Moreover, 9% (51/552) of children were described as having significant skin scars. In this national prospective study, we obtained data from 98% of paediatric inpatient units in Belgium, allowing us to reliably assess the burden of varicella disease in our country, both in terms of incidence and severity, and to identify the paediatric groups that will benefit the most from vaccination. 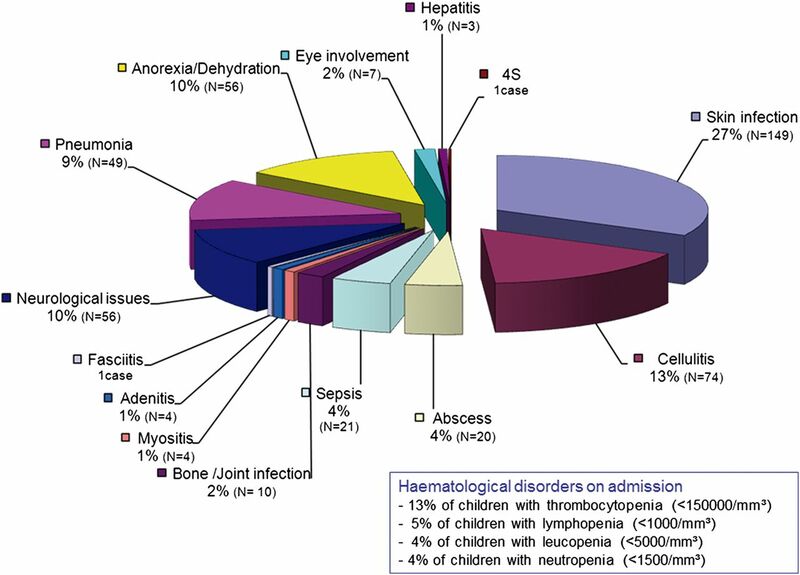 Because the diagnosis of each varicella case was confirmed by a paediatrician, our data could be gathered in a more reliable manner compared with others using only hospital computed databases.27 Limitations have, however, to be recognised. First, some children might have been hospitalised for infectious complications secondary to recent varicella that was not identified by the clinicians as the risk factor. The national VZV burden observed here might therefore be underestimated. Second, our 1-year study did not allow controlling for year-to-year variations in varicella incidence.28 Although the reported incidence might have suffered from overestimation or underestimation, we demonstrated a significant burden of disease among the general childhood population with highest impact in previously healthy young children (0–4 years old). The varicella-related mortality was very low, but the duration of hospitalisation was ≥5 days in 25% of subjects. As detailed in table 3, our data show a much higher incidence of varicella hospitalisation than reported by other nationwide studies from Europe.22–24 ,26 However, the design of these studies (eg, inclusion criteria, definitions of complication) varies widely from one country to another, making direct comparisons extremely difficult. Our results are nevertheless very similar to those from neighbouring Northern France, where Dubos et al25 also included complicated and uncomplicated varicella cases. By including all varicella hospitalised cases regardless of their severity, we attempted to obtain a real life overview of varicella-related inpatients in our country. The reasons why more than one-third of children classified as uncomplicated varicella were hospitalised remain intriguing. The proportion of uncomplicated cases was the highest among infants, which could illustrate paediatricians’ fear of varicella complications or parental difficulties in managing the disease. A high frequency of uncomplicated inpatient varicella cases (20–43%) has also been reported in other European studies enrolling unselected hospitalised cases of varicella25 ,26 ,29 and deserves further investigation. Finally, it has recently been estimated that the incidence of paediatric outpatient visits for varicella in Belgium was 4950/105 person-years in children under the age of 5 years old.19 Taking into account our incidence of hospital admissions for varicella in this age group, we can estimate the corresponding rates of hospitalisation and of complicated hospitalisation among all varicella ambulatory cases to be around 1.6% and 1.0%, respectively. This extrapolated result reflects a high burden of varicella disease but has, however, to be carefully considered, since the number of varicella outpatients could be overestimated (recurrent consultations for the same patient) or underestimated (additional visits to the paediatricians or to the emergency room). UV against varicella has been highly successful in many countries.6 ,4–12 In the USA, implementation of the one-dose varicella immunisation programme in 1997 led to a 89.8% decrease in the global incidence of varicella cases in 2005.6 Substantial reduction in deaths, hospitalised cases, outpatient visits and medical costs related to varicella were also demonstrated.10 ,11 In Germany, similar results were published despite a lower coverage rate with a one-dose schedule.9 ,12 A 2-dose schedule (including a second dose administered at variable ages) was recently implemented by most countries with UV programmes.13 This significantly improved the varicella vaccination effectiveness by a further reduction in disease incidence and breakthrough infections.30 Despite these successes, varicella UV remains debated in most European countries and recommended only for at-risk groups.27 Bonanni et al31 have, however, concluded that vaccination targeting only adolescents and at-risk groups was unable to interrupt virus transmission and was much less efficacious than UV. Additionally, our study as well as others22–24 ,28 ,32–34 clearly demonstrate that most hospitalised children with varicella were previously healthy; this constant finding is a strong argument in favour of varicella UV. Our recent comprehensive national survey now supports the implementation of varicella UV in Belgium and at least fuels the debate in other European countries without UV. Varicella demonstrated a substantial burden of disease, especially among the youngest and previously healthy children. Our thorough nationwide study offers recent data to fuel the debate and supports varicella UV in European countries. However, some hypotheses still deserve further evaluation and postvaccination long-term surveys are needed to assess the effectiveness and costs–benefits of this new potential vaccination policy. We thank Mrs Véronique Léon for her constant and efficient technical support during the whole study. We thank Perle Rillon for her participation in data collection. We are grateful to all members of the Varicella Belgian Collaborative Study Group for their active participation in data collection.
. Varicella-zoster virus. In: Long SS, Pickering LK, Prober CG, eds. Principles and practice of pediatric infectious diseases. Churchill Livingstone Elsevier, 2008:1021–4.
. Preventing varicella: recommendations for routine two-dose varicella immunization in children. Canadian Paediatric Society Infectious Diseases and Immunization Committee. Paediatr Child Health 2011;16:415.
. Impact of the routine varicella vaccination programme on varicella epidemiology in Germany. Euro Surveill 2010;15:pii:19530. Centers for Disease Control and Prevention. Prevention of varicella: recommendations of the Advisory Committee on Immunization Practices (ACIP). MMWR Recomm Rep 2007;56(RR-4):1–40. ECDC Report. Varicella vaccine in the European Union. European Centre for Disease Prevention and Control. 2014.
. The nature of Herpes zoster: a long-term study and a new hypothesis. Proc R Soc Med 1965;58:9–20.
. Epidemiologie van windpokken en zona vastgesteld door huisartsen: 2006–2010. Vlaams Infectieziekte Bulletin 2012;4:5–10.
. Vaccination coverage survey of children (18–24 months) in the French community (Belgium), [Report in French], Provac, Ecole de Santé Publique, ULB, 2012. SPMA Standardized Procedures for Mortality Analysis—Belgium Public Health and Surveillance. Scientific Institute of Public Health, Brussels, Belgium. https://spma.wiv-isp.be (accessed 9 Sept 2014). KCE reports 151B. Rapport coût-utilité de la vaccination contre la varicelle chez les enfants, et de la vaccination contre le zona chez les adultes en Belgique. Centre fédéral d'expertise des soins de santé/Federaal Kenniscentrum voor de Gezondheidszorg. 2010.
. Population-based studies of varicella complications. Pediatrics 1986;78(4 Pt 2):723–7.
. Vaccination coverage among adults, excluding influenza vaccination—United States 2013. MMWR 2015;64:95–102. Collaborators Members of the Varicella Study Group: W. Asscherickx, Algemeen Ziekenhuis Diest (Diest); H. Audiens, Algemeen Ziekenhuis Sint-Maarten (Mechelen); M. Azou, Algemeen Ziekenhuis Damiaan (Oostende); E. Baten, Algemeen Ziekenhuis Sint-Lucas (Brugge); Th. Bertrand, Centre Hospitalier Tubize-Nivelles (Nivelles); B. Beullens, Regionaal Ziekenhuis Sint-Trudo (Sint-Truiden); A-S Bouteiller, Centre Hospitalier Interrégional Edith Cavell (Brussels); B. Bruylants, Onze Lieve Vrouwziekenhuis (Aalst); B. Candi, Centre Hospitalier Régional Clinique Saint-Joseph—Hôpital de Warquignies (Mons); E. Cavatorta, Centre Hospitalier Universitaire André Vésale (Montigny-le-Tilleul) et CHU de Charleroi (Charleroi); I. Corthouts, Algemeen Ziekenhuis Sint-Blasius (Dendermonde); C. Croisier, Centre de Santé des Fagnes (Chimay); J. Delbushaye, Clinique Reine Astrid (Malmédy); L. De Lille, OLV van Lourdes Ziekenhuis Waregem (Waregem); S. Deman, Algemeen Ziekenhuis Sint-Lucas (Ghent); A. Demeester, AZ Delta, campus Menen (Menen); C. Denoncin, Cliniques du Sud-Luxembourg (Arlon); J-P. De Roeck, Centre Hospitalier de Mouscron (Mouscron); I. De Schutter, Universitair Ziekenhuis Brussel (Brussels); K. De Schynkel, Algemeen Ziekenhuis Maria Middelares (Ghent); A. de Selys, Clinique Saint-Jean (Brussels); H. Desimpel, Sint-Rembertziekenhuis VZW (Torhout); D. De Temmerman, Hôpital Erasme (Brussels); B. Duvivier, Intercommunale Hospitalière de Famenne Ardenne Condroz (Marche-en-Famenne); K. Eerdekens, Ziekenhuis Maas en Kempen (Bree); M. Elyahyioui, Centre Hospitalier Hornu-Frameries (Hornu); L. Fedora, Algemeen Ziekenhuis Lokeren (Lokeren); J. Franckx, Onze Lieve Vrouwziekenhuis (Asse); J. Frère and C. Lerusse, Centre Hospitalier Régional de la Citadelle (Liège); K. Garmyn, Heilig Hart Ziekenhuis VZW (Lier); C. Genin, Centre Hospitalier Chrétien (Montegnée); ML. Gielen, Algemeen Ziekenhuis Vesalius (Tongeren); E. Gueulette, Clinique Maternité Sainte-Elisabeth (Namur); L. Guzganu, Centre Hospitalier de Jolimont-Lobbes (Lobbes); N. Hemelsoet, Grand Hôpital de Charleroi (Charleroi); F. Henckens, Sint Franciskusziekenhuis (Heusden); J. Jaumotte, Centre Hospitalier de Dinant (Dinant); Ph. Jeannin, Algemeen Ziekenhuis Jan Palfijn (Ghent); L. Joachim, Centre Hospitalier Universitaire Tivoli (La Louvière); T. Jonckheer, GZA Ziekenhuizen (Antwerp); T. Khalil, Centre Hospitalier de Jolimont-Lobbes (Haine-Saint-Paul); S. Kreitz, Sint-Nikolaus Hospital (Eupen); P. Lemay, Algemeen Ziekenhuis Turnhout (Turnhout); F. Lemmens, Ziekenhuis Oost-Limburg (Genk); E. Lenga, Centre Hospitalier de la Haute-Senne (Soignies); J. Levy, Centre Hospitalier Universitaire Saint-Pierre (Brussels); A. Lubrez, Hôpital de la Madeleine (Ath); M. Maka, Clinique Louis Caty (Baudour); I. Matthijs, AZ Delta Roeselare (Roeselare); M. Michel, Clinique Saint-Pierre (Ottignies); M. Naert, Algemeen Ziekenhuis Sint-Jan Brugge-Oostende (Oostende); K. Naudts, Algemeen Ziekenhuis Sint-Elisabeth (Zottegem); A-M Nica, Centre Hospitalier Régional de Huy (Huy); A. Nobre-Machado, Hôpitaux Iris Sud (Brussels); L. Oosterlynck, Algemeen Ziekenhuis Groeninge (Kortrijk); S. Peeters, Algemeen Stedelijk Ziekenhuis (Aalst); J. Persyn, Sint-Andriesziekenhuis (Tielt); M. Pletincx, Centre Hospitalier Interrégional Edith Cavell (Brussels); M. Proesmans and F. Vermeulen, Universitair Ziekenhuizen Leuven (Leuven); K. Quaegebeur, Stedelijk Ziekenhuis (Roeselare); J-F. Questiaux, Centre Hospitalier Peltzer-La Tourelle (Verviers); M. Raes, Jessaziekenhuis (Hasselt); J. Ramet, Universitair Ziekenhuis Antwerpen (Edegem); F. Renders, Algemeen Ziekenhuis Sint-Augustinus (Veurne); A-M. Rentmeesters, Regionaal Ziekenhuis Heilig Hart (Leuven); N. Saive, Centre Hospitalier du Bois de l'Abbaye et de Hesbaye (Seraing); K. Sauer, Algemeen Ziekenhuis Sint-Jan Brugge-Oostende (Brugge); P. Schelstraete, Universitair Ziekenhuis Gent (Ghent); K. Segers, Algemeen Ziekenhuis Sint-Jozef (Malle); M-C. Seghaye, Centre Hospitalier Universitaire Liège (Chenée); E. Sercu, Jan Yperman Ziekenhuis VZW (Ieper); T. Slaouti, Cliniques de l'Europe (Bruxelles); L. Snoeck, Algemeen Ziekenhuis Oudenaarde (Oudenaarde); J-Ph. Stalens, Centre Hospitalier de Wallonie Picarde (Tournai); J. Thijs, AZ Nikolaas (Sint-Niklaas); G. Tshibuabua, Center Hospitalier Régional du Val de Sambre (Auvelais); D. Tuerlinckx, CHU Dinant-Godinne (Godinne); G. Vandecasteele, Algemeen Ziekenhuis Sint-Dimpna (Geel); L. Van den Berghe, Sint-Vincentiusziekenhuis (Deinze); L. Vandenbossche, Mariaziekenshuis Overpelt (Overpelt); P. Vandenbroeck, Sint-Jozefskliniek VZW (Izegem); E. Vandenbussche, Algemeen Ziekenhuis Sint-Elisabeth (Herentals); A. Vander Auwera, GZA-Ziekenhuizen (Wilrijk); K. Vanderbruggen, Algemeen Ziekenhuis Zeno (Knokke-Heist); D. Van der Linden, Cliniques universitaires Saint-Luc (Brussels); S. Van Eldere, Imelda Ziekenhuis (Bonheiden); T. Van Genechten and I. Vlemincx, Algemeen Ziekenhuis Monica (Deurne); H. Van Hauthem, Regionaal Ziekenhuis Sint-Maria (Halle); B. Van Lierde, Algemeen Ziekenhuis Glorieux (Ronse); S. Van Lierde, Regionaal Ziekenhuis Heilig Hart VZW (Tienen); M. Van Oort, ZNA Koningin Paola Kinderziekenhuis Antwerpen (Antwerp); S. Van Steirteghem, Centre Hospitalier Universitaire Ambroise Paré (Mons); P. Verbeeck, Ziekenhuisnetwerk Antwerpen (Merksem); L. Verdonck, Algemeen Ziekenhuis Alma (Eeklo); M. Verghote, Centre Hospitalier Régional (Namur); R. Verniest, Algemeen Ziekenhuis Klina VZW (Brasschaat); Ch. Versteegh, Centre Hospitalier Interrégional Edith Cavell (Braine-l'Alleud); P. Vincke, Centre Hospitalier de l'Ardenne (Libramont); Ph. Watillon, Clinique Notre-Dame de Grâce (Gosselies). Contributors SB and PL designed the project and wrote the manuscript. SB did the data analysis. MS provided important help in data collection and analysis and contributed to improve manuscript writing. Funding This study has been supported by a scientific unrestricted grant from GSK Belgium. Competing interests PL has received an unrestricted grant from GlaxoSmithKline Biologicals, Belgium, to support the study. PL has received fees for serving on advisory board from GlaxoSmithKline Biologicals. Ethics approval The study protocol was approved by the ethics review committee of the coordinating centre (HUDERF). Should the UK introduce a universal childhood varicella vaccination programme?